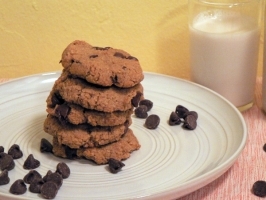 Almond flour and coconut oil boost the nutrition on these cookies. See why these cookies use almond flour! In a large bowl combine coconut oil, palm sugar, applesauce, and vanilla. Using a wooden spoon to “cream” together until well combined. In a medium bowl combine flours, baking soda, and salt. Combine dry ingredients into wet ingredients. Stir well. Add chocolate chips; stir well to combine. The batter will seem a bit dry, this is OK. Using a tablespoon or small cookie scoop drop batter onto a baking sheet lined with parchment paper. Alternatively, form the dough into 1/2 inch balls. Press the dough down to achieve flat cookies. This dough will not spread out like a traditional cookie dough. The thickness of the cookie placed in the oven will be nearly identical to the finished product. Allow to cool for 5 minutes before eating.